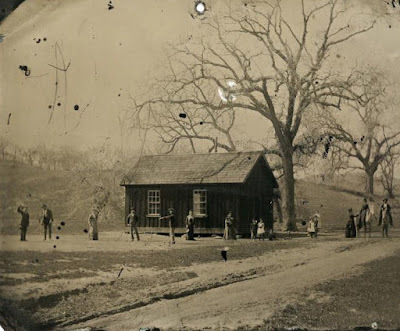 This peaceful scene (the whole right part looks almost like a romantic painting) of a game of croquet set in the American South, generated considerable media interest, once it was established that one of the men pictured was none other that the notorious outlaw, Billy the Kid. Billy, it should be explained, was considered to be both ruthless and dashing, and had a dramatic end at an early age involving a shoot out with the sherifs. Billy himself, looking just a little bit dangerous? Can have? In my experience, typically must have. It is the very foundation of evil deeds. Governor Lew Wallace at the time: "A precious specimen named ‘The Kid’ ... is an object of tender regard." Is the man out-of-law always that frightening? Or maybe correcting errors he cannot control? In a world, where purposes do not connect, there is some kind of domino effect in placing the errors in regard to one purpose or another. A whole system of trial and error is played upon the purposes, forgetting the principles that raised them. According the written stories, Billy seems to have been played out in a world of purposes, from the family to the state to the law. In regard to Wallace's writing "... an object of tender regard..." the word object highlights in this phrase. Why choosing the word object and not a person? Is it by 'slapping the purpose' into 'the shrubbery' that permits us to forget that purpose has to reduce itself to expressions that sustain the purpose and cannot do otherwise? Can we ever become neither in- laws nor out-laws, when the ground to be played upon is violent by itself? I did look up a bit about Billy, but isn't the interest in the image just the 'conventional' view of what it means to be an outlaw? In other words, we create our stereoptypes. A picture of Billy thus 'should' show him doing something dangerous, or maybe dashing. Not to say leaningon his croquet stick isn't a 'little bit' dashing too! A crocodile is an interesting coutrer-example, of course Tessa is right, they are the most lovely little things when young, quite cuddly, and of course crocodile Mums must be very attentive.